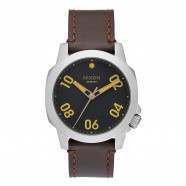 Nixon Watches - Nixon Time Teller Watch - All Indigo / Natural :: Men > Watches. 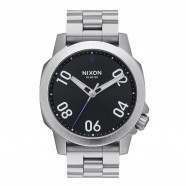 Dial: The dial includes printed indices. and custom molded handsSolid stainless steel fixed bezelCase: 26mm wideMovement: Miyota Japanese quartz 3 handTriple gasket stainless steel crownNixon Watch100 meter/10 ATM custom stainless steelBand: 14-12mm tapered custom 5 link stainless steelHardened mineral crystal lensJewelry style bracelet and stainless steel locking clasp Size: one size.